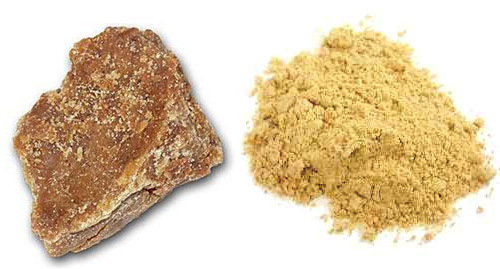 Asafoetida is the dried, resin and gum collected from three species of the Ferula plant, Ferula assafoetida, a relative of Carrot & Fennel, which is then ground to a fine powder. Today, the plant grows only in parts of Iran, Afghanistan and Kashmir. It gets its name from the Persian word Aza, which translates as mastic or resin, and the Latin word Foetidus, which means stinking. Stinking resin, is pretty much what it is. The species of giant fennel that produces the Asafoetida gum, exudes a vile odor and are native to the mountains of Afghanistan, but are mainly cultivated in nearby India. The smell of the powder may strike you as overpowering and somewhat unpleasant, but cooking it mellows it out and produces a flavor similar to leeks, onions and garlic. It is typically used as a flavor enhancer. Asafoetida powder, also known as Hing, Asant, Food of the gods, Giant fennel, Jowani badian, Stinking gum, Devil's dung, and Ting, is a crucial ingredient, along with turmeric, of Indian cooking.